The EIS switch module is fitted to most modern Mercedes-Benz vehicles and is the name given to the Mercedes electronic ignition switch. When repairing our first EIS immobiliser key module fault, never did we think this would become such a wide spread problem. We are seeing units sent in from all over the world every single day and the fault is affecting all models fitted with an EZS / EIS switch system. We have found similar faults within the Electronic Steering Lock (ESL) and we request all customers to send in their Mercedes ESL unit along with a key and the EIS together so that we can connect them on the bench and test all parts thoroughly. The most common fault with an ESL is the lock not engaging or disengaging but whatever the fault, we are able to replicate it on our purpose built test rig and repair accordingly. 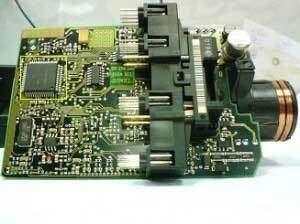 If your EIS switch unit has failed completely, it can throw out the key and cause the key to become faulty as well. It doesn’t always happen but we have seen it quite a few times. If you insert both keys into a faulty EIS module, you can expect both keys to potentially fail. Not only can we repair key faults, we can also build you a new key if required. Our EIS, ESL + Ignition Key repairs have become extremely popular amongst Mercedes owners and we maintain an impeccable success rate. Our purpose built testing rig can test the units in all conditions, which does include simulating extreme weather conditions where customers find their units failing in cold temperatures. Check out our extensive Mercedes EIS / EZS Repair article and if yours is faulty, get in touch to find out how we can help you! Tags : EIS Switch, ESL Fault, ESL Repair, EZS Fault, EZS Repair, Mercedes EIS Fault. My EIS is acting up on my 2004 E320, what is your estimate for conducting the repair if I provide the EIS and key. In addition, can the EIS just be replaced without having to go through the reprogramming process. I have sent you an email with full information and pricing for the testing and repair of your EIS and Key. Replacement EIS units must be programmed in to match the system. I have owned my Vauxhall Insignia Exclusive for just under two years and have owned many different makes of cars in the past, I consider my experience in dealing with members of staff at Garages including main dealers over the past 15 years to be a nightmare. My most recent ordeal was with Go Vauxhall in Lewisham where I have been made a victim of a complete rip off after been advised into what they consider to be a professional and cost effective mechanical analysis costing me over £1600. They said this includes having a full diagnostics and to have the major parts including cam belt, glow plugs and air conditioning replaced giving that the car has exceeded 100000 miles and I shouldn’t have to worry about any mechanical failure before another 100000 miles. After all this, I was very convinced that my car will be ok for at least another year but unfortunately just under 6 weeks despite all their professional advice my clutch went, my air flow metre than my DPF. I could go on forever explaining all the bad experiences I have had with local Garages but this review is about Sinspeed who has become my saviour. After having my car towed to a local Garage where I have been charged expensive rates for unblocking the DPF, I was still unable to drive my car. After been fed up with been ripped off and again been quoted more expensive rate such as £2100 – £1500 to replace the DPF, I decided to do an online research for the best option this is how I discovered Sinspeed. I was immediately fascinated with the detailed mechanical breakdown of how they approach these problems and some very convincing methodologies that they will undertake to rectify the problem. After all my bad experiences I was still a bit sceptical about the idea of using Sinspeed but my mind was made up after a long conversation with a tactician called Saff over the phone. Now my car is running superbly and I have saved £1500 in my pocket. Sinspeed is a company that does what it says on the tin. Thank you so much for your detailed review! It’s great to hear that we were able to resolve the issues that you were experiencing on your vehicle – if you have any queries in the future, please do not hesitate to get in touch. I have a 2011 350S Class Mercedes, the ignition key turns but no lights are coming on and it wont start. I am on the south coast near Worthing, do you cover this area?